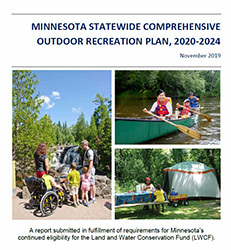 The 2014-2018 State Comprehensive Outdoor Recreation Plan (SCORP) is Minnesota’s outdoor recreation policy plan. It gives outdoor recreation decision-makers and managers a focused set of priorities and suggested actions to guide them as they make decisions about outdoor recreation. The National Park Service requires this plan to maintain eligibility to participate in the federal Land and Water Conservation Fund (also known as the LAWCON or LWCF) program. Increase participation in outdoor recreation by all Minnesotans and visitors. Connect people to the outdoors by providing a welcoming environment, improving access and affordability, increasing marketing efforts, expanding programming, creating partnerships and providing a quality experience. Acquire land and create opportunities by placing a priority for acquisition and development in parts of the state that have the fewest opportunities per person now and projected into the future, particularly densely settled and growing areas; regional centers; private in-holdings in existing parks; trail connections; and lands and facilities that serve tourists and local residents. Take care of what we have with regular reinvestment to ensure safe, high-quality experiences for current and future users. Coordinate among partners by creating integrated and accessible information and enhancing coordination across jurisdictional boundaries, funding resources, and among agencies, organizations and nonprofits.